Oh my! I listened to Wuthering Heights on audio read by Prunella Scales many times over the years and have always enjoyed it. Then I downloaded the book onto the Kindle and finally got around to reading it too. I'll admit this is the first time I've read a re-imagined book about a classic. It was amazing. My heart sort of dropped down to my stomach when I spotted this one at the library. 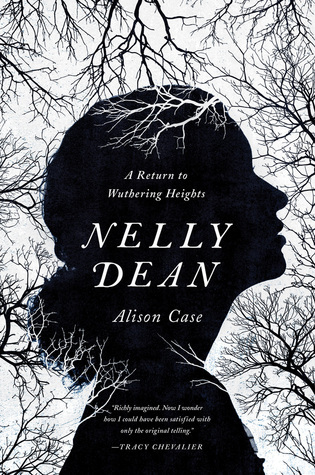 Wuthering Heights was also told through the eyes of Nelly Dean, but fearing to blush many times over in front of poor Mr. Lockwood would seem too much. It was one thing to tell the tale of the Earnshaws and the Lintons, but to bare one's own soul was inappropriate at the time. And as the Earnshaws don't do anything halfway good or bad, sweet Nelly Dean also has a fair amount to drama to share. Growing up in the Earnshaw home with her mother serving as housekeeper, Nelly almost thinks of Hindley and Cathy as her siblings. But a turn of events thrusts Nelly as then a young teen, into the life of servanthood. How will she react to this awkward new position in the household she loved so much? How much betrayal and heartache can one person withstand? Thankfully there is a bit of unintended comic relief in the form of Joseph the servant, a true Bible thumping Christian. Nelly comes to him saying, "There is something that has been worrying me, and I wonder if you might be able to help." To which Joseph replies, "If it's your soul, yo've good cause to worry, and there's naught I can do for yo." This breathtaking and well-written novel made me laugh a few times and cry many, many more. It explores the subject of loss at the deepest levels. Put on a brave face if you're going to get through this one. It will be worth it though!